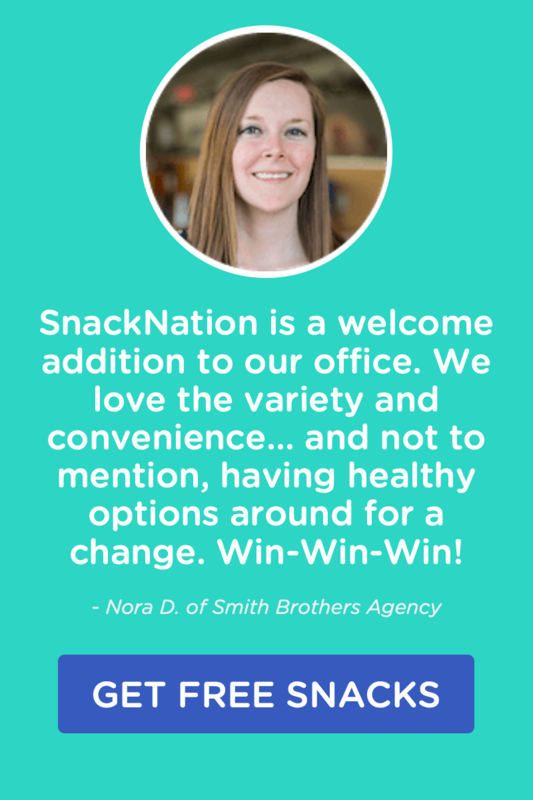 We wanted to know plain and simple the healthy work snacks they recommend. You see, the easiest way to stay healthy at work is to have healthy options readily available. That way we reach for the good stuff when we’re “hangry” in the afternoon. They break down why it’s their favorite and the health benefits of each. Plus there are some really interesting & healthy snacks that taste good that you may not have considered before. Here are the most popular healthy snacks at work, as voted on by our readers. My favorite healthy snacks for work are a handful of nuts and string cheese. Keeping it low carbohydrate will not slow you down and the high protein will satisfy you until your next meal. Plus, the healthy fats in nuts will add an added dose of needed nutrition to your day. Greek Yogurt with blueberries and almonds! One of my favorites! If I’m pretty hungry and know that 10 almonds isn’t going to cut it, I’ll throw a high-quality, low sugar packet of oatmeal (such as Nature’s Path Hemp Plus) into a mug, pour in some hot water and then mix in a tablespoon of nut butter. As long as there isn’t added sugar, I like the nut butters that come in little packets because I don’t trust myself around a jar! This is also my go-to plane snack because the ingredients travel well. Another one of my favorite good snacks to eat at your desk: roasted chickpeas—they pack fiber and potassium and are easy to make at home. You can add whatever spices you like, such as cinnamon, cumin, or cayenne. I don’t recommend picking a single “favorite” snack as a key to satisfying you and your body is giving it what it needs and that includes what you want- give it savory when you want sweet and typically you go find sweet later. 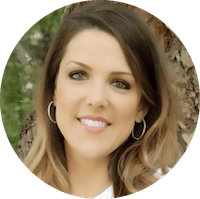 What I look for is something that hits my 4 pillars on the Better Nutrition Simplified Plan – quality, quantity, nutrient balance, and frequency. Some healthy snack ideas might be a sweet treat Nature’s Path Qi’a bars or Manitoba Harvest hemp heart bites with a Daily Greens renew, or a pit workout smoothie like my Chocolate Milk 2.0 featuring Symbiotics to optimize lean body mass and gut health, or I grab an Earthbound Farms Power Meal or when traveling I make Natural Calm magnesium with brassica tea (the glucoraphanin is a potent detox enabler) and have Nibmor dark chocolate (70-80%) with a packet of Justin’s peanut or almond butter. The perfect snack in my opinion is a piece of fruit along with a handful of nuts. I prefer to eat the fruit first, then the nuts. The fruit provides a balanced amount of healthy carbs and fiber, while the nuts provide fiber, healthy fats and a decent amount of protein. I find this combination to be incredibly filling, without too many calories. I have raw almonds, fruit, seaweed snacks, Larabars, and kombucha in my office. When I’m eating, I make it a priority to pair something with protein with something with fiber at every meal. That helps me control the amount of insulin my body produces. The major weight loss makes my body very sensitive to high glycemic foods, so I have to avoid them. But when I really want to be naughty I eat organic corn chips and dip them in half an avocado. And what do I eat when I’m NOT being careful at all? Vosges dark chocolate with bacon. Dear Lord, I would LOVE if she went organic. My favorite healthy office snack is unsweetened dried fruit! It lasts a long time, it’s easy to eat and it’s filled with natural deliciousness. Dried fruit is high in fiber and nutrient dense. Plus, dried fruit is a great source of energy when you need a little pick-me-up at work because they contain little to no fat while also containing a significant amount of calories. Some of my favorite dried fruits to keep on hand are dried mango, dried apple, dried pear, dried banana and for a special treat, dried bananas covered in dark chocolate. My favorite healthy are fruit and homemade trail mix. For fruit, I like “sturdier” fruits that can be shelf stable for a few days like apples, pears, oranges, and stone fruits like peaches/plums/nectarines. For my homemade trail mix I use 1/4 cup of high fiber cereal, 1/4 cup of Original Puffins, 1/4 cup of Kashi Heart to Heart, 1 tbsp Cashews, 1 tbsp almonds and 1 tbsp walnuts. I mix it all together and keep it in a ziploc bag – and it’s a great accompaniment to fruit when my mid-day munchies come around! I’m a huge Greek yogurt fan – I mix in some nuts and dried cranberries. My other regular choice of healthy foods are raw veggies with a Wholly Guacamole packet – so yummy and satisfying. I also love KIND bars – the Dark Chocolate Nuts & Sea Salt is my favorite! For me, the perfect snack is the right mix of carbs, protein, and fat. It also is sweet and satisfying. I typically make my own trail mix on Sunday night’s and prepackage them into resealable plastic bags [1/2 cup portions]. The trail mix usually includes almonds [protein], dried fruit [carb], and mini chocolate chips [fat]. While there are plenty of good store bought trail mixes, I like being able to control the sodium and calorie content of my own mix. When it comes to snacking at the office (or even on-the-go) we keep it simple and easy to implement! I take my protein shaker with the whey powder already inside and simply add water when I’m in need of a boost. Combine that with a piece of fruit and you not only get some quality protein (that you are in probably need of anyways) but also an energy boost via your fruit which makes for the perfect office breakfast idea and helps with getting past the dreaded mid-afternoon slump! My favorite healthy snack to keep at the office is nuts. They contain healthy fat and protein, which keep you full and satisfied until your next meal. Nuts are also high in fiber yet low in net carbohydrates (total carbohydrates minus fiber). They’re rich in the minerals magnesium, zinc, and selenium. And, of course, they’re absolutely delicious! A one-ounce serving (about 1/4 cup) contains 160-200 calories, depending on the type of nut. If you’re following a low-carb lifestyle, try to choose nuts that are lower in net carbs (macadamias, pecans, almonds, hazelnuts) rather than higher-carb varieties (cashews and pistachios). Salted or unsalted? Raw or roasted? The choice is yours, based on your preferences and nutrition-related goals. My favorite snack to have in the office varies depending on what my or a client’s current health goal is. If my goal is weight loss, which is true as I am still shaking the baby weight from my second child born this summer, I’d pack large organic carrots. Having a portable, healthy carb and crunchy snack like this will help me follow true hunger. Having something healthy like carrots prevents me from eating something out of boredom, stress or thirst. Other ideas include portioned 1-2 ounce nuts (I love the raw almonds sold at Trader Joe’s). These are great snacks if I know I have 5-7 hours between my lunch and dinner. And lastly, dark chocolate. This is a great thing to have on hand in an office where treats, baked goods and birthday cakes are debuted all too often. A healthy treat like dark chocolate can be a good swap for something dessert-like without derailing health goals. Of course baked goods are fine to have when a client or myself really want it, but it’s also good to only indulge when those things are really worth it. I have a couple regular work snacks in my rotation (hummus and raw veggies, a green smoothie, the occasional Think Thin bar), but right now I’m loving a brown rice cake spread with a a thick layer of Justin’s almond butter. Justin’s makes these adorable single serving packs, and if you keep a bag of brown rice cakes in your desk/office kitchen, you can throw it together whenever you start to fade. The combo of protein, healthy fat and fiber gives you a great energy boost and keeps you full for a couple hours. If you work from home like I do, try adding a drizzle of raw honey, some hemp seeds or sliced bananas. The snack I’m hooked on right now is a couple of brown rice cakes topped with almond butter accompanied by Greek yogurt or cottage cheese topped with blueberries, raspberries, or other fruit and sprinkled with cinnamon. So good, filling, and keeps me satisfied till my next meal! A home made trail mix with nuts, seeds and chocolate chips – for healthy fats to keep me full and a little hit of chocolate to prevent going for less healthy chocolate bars! I love Mary’s Gone Crackers! They’re packed with healthy seeds and fiber and taste great with some homemade beet hummus or tzaziki. Compared to most gluten free crackers they seem minimally processed – they’re even varying sizes! One of my favorite healthy desk snacks would be a Quest Nutrition Bar. They taste amazing and the macros are fantastic for my goals. Want more on Quest? Hear co-founder Tom Bilyeu talk about the origins of this life-changing bar on the Brand Builder podcast. My favorite healthy snack is fresh fruit. It may sound simple, but fresh cut pineapples, apples, mango, kiwi, peaches and more are my faves. I also love blending up mini smoothies. And also avocado toast. My favorite healty snacks to keep at work are 2% greek yogurt and cottage cheese. I like these options because I can buy snacks for the office at the beginning of the week and stock the fridge for a convenient mid afternoon pick me up that’s protein packed and will keep me fueled until dinner time. I usually pair these dairy proteins with fresh berries for sweetness and seeds for texture and fiber. My current favorite healthy snack is actually pretty odd, but I would have to go with coconut oil. I am busy with patients certain days for literally 12 hours straight so many times I don’t have time to snack. If I have a quick tablespoon of coconut oil and some cold brew, I stay full and mentally sharp for hours. This is a super quick way to get a huge pop of energy as quick as possible. I stock up on eXo, Mammoth and Bricks bars for times in between when I have the moment to chew! My snacks are dark chocolate, fruit, and leftovers. Mostly leftovers. My favorite healthy snack is a toss up between roasted chick peas and roasted broad beans. Both are packed with protein and fiber to help balance blood sugar and sustain energy levels. They are also non-perishable, a big plus during warm weather months. I have no financial affiliation with either company mentioned – just my preference after tasting many brands. I also like to keep apples and baby carrots around but those have a more limited shelf life. Believe it or not, I eat a lot of baby food as a healthy to-go snack. Parents are very discerning about what their kids eat and since the kids don’t make the buying choices for themselves baby snacks are generally more healthy than adult ones, including the low end brands, which can be convenient if you’re not at a high-end health food store. My favorite brand is Beech-Nut, and all their choices have a clean ingredient stack and usually have a decent vegetable component to them as well. They only cost about $1/bottle so it’s a very easy and convenient way to eat healthy food on the go! My favorite healthy snack is one that my mom introduced to me when I was a wee lass. Ants on a log! They are celery sticks with peanut butter spread in the groove and raisins lined up one after the other. Fun, simple AND nutritious! My favorite snack to have on hand is a small bag of raw nuts and a piece of fruit, like an apple. I like to have healthy fats and fruit with fiber to keep me feeling full for a long time. Plus it’s easy to carry around with my anywhere I go. I actually make my own homemade snack bars, which combine a good mixture of fat and protein and complex carbs to keep me satiated and energized throughout the day. 2. Comine all ingredients in a food processor (or strong blender) until thoroughly blended. 3. Measure out 1/4 cup scoops and put them onto a greased baking sheet. 4. Bake for 12-15 mins. My go to favorite healthy snack is a protein shake using Gnarly Vanilla Whey, sunflower seed butter and 1/2 banana. It’s been my daily snack pretty much every day forever. Sorry it’s not very original, but I keep a single serving blender at my office and blend a shake up every single afternoon around 3:00 pm. This helps keep me full while I teach back to back classes. The banana keeps the shake nice and thick, the protein and fat (from the seed butter) helps to keep me full since I don’t get to again until I get home around 9:00pm. On the rare occasion that I don’t get a shake, I love Quest Bars and I am a sucker for trail mix. I try not to keep it around because who can stick to a single serving size? My kitchen is my office..so I struggle with trying not to snack on everything I make! I try to have pre-made healthy snacks to eat at work like protein balls, home-made granola bars, and protein cookies in my freezer for a grab on the go snack or for something small after a workout. I love having snacks that I’ve made ready-to-eat because I know that they are made with whole/real ingredients! I am also a big fan of dipping fruit and veggies into my favorite nut butter, because who doesn’t love sweet and salty? My favorite healthy snack is my homemade granola which I make with organic oats, sunflower seeds, shredded coconut, protein powder, cinnamon, almonds and cacao powder. I like it because it contains a ton of minerals, protein, fiber and healthy fat. Other go to snacks are a cup of mixed almonds and walnuts and a green apple. I actually don’t work in an office as I’m a full-time nomad (coffee shops are kind of my office, I guess). But, when I’m driving long distances I usually carry both Vega Bars and Pink Lady Apples. My favorite snack at the office are nuts and specifically cashews. They provide me with energy and good fats and are an easy snack to have handy. Plus, they are great for your mind. One of my favorite snacks is a Quest Bar. 20g protein, 15g fiber, gluten-free, no added sugar, and no artificial anything. One snack that goes anywhere and everywhere is Perky Jerky. The downside is that vegetarians/vegans are left out of the snacky goodness. But for carnivores, the 1 oz packets (60-80 calories) are a protein loaded gift. We typically have the Original Turkey Jerky daily. Other, bigger eaters, may opt for a 2.2 oz packet. Another perk for office workers is that it won’t go bad. Summary: satisfying, tasty, good nutrition profile esp. for the Original Turkey, travels well, keeps well. It’s all about the quality and calories of the snack that matters – make them less than 200 calories and make sure they contain real ingredients. That’s why I love these new goodnessknows snack squares. They’re made with whole nuts, real fruits, and toasted oats, in delicious dark chocolate so it delivers on both taste and nutrition. Best of all from a nutritionist standpoint is the pre-portioning- each 150-calorie bar is divided into four perfectly portioned squares – allowing every family member to eat the amount that’s right for them. Plus, they contain no artificial colors, flavors or sweeteners. I also am a huge fan of the classic apple or celery and peanut or almond butter. You’re never too old to make ants on a log! I find almonds to be the easiest way to curb hunger pains without the guilt! Today there is so much variety when it comes to selecting this tasty snack. I often mix unsalted roasted almonds with raisins and stash them either in my gym bag or car. However I have made a few new discoveries that have switched up snack routine! Recently while traveling I stumbled upon Sriracha flavored almonds from Blue Diamond, the idea that healthy food has to be bland can’t be further from the truth! Another new discovery are Harvest Soul Tropical Fusion juices, these are an organic chewable line of juices that include almonds! In addition to almonds the juice includes Goji Berries, Golden Berries, Pumpkin Seeds, Raspberries and Blueberries. Each bottle contains a high amount of fiber making it perfect for that mid-afternoon slump. My favorite snack are Quest Bars! They’re great on every level – taste, convenience, and nutrition (20g protein, 1g sugar, high in fiber). My favorite flavor is the Mint Chocolate Chunk. My go-to balanced snack is a beef stick, almonds and dried fruit, because I can keep it in my desk, purse or even in my car and it’s “PFC balanced,” meaning it contains protein, healthy fat and nutrient-dense carbohydrates resulting in balanced blood sugars, moods and consistent energy levels all day long! My favorite snacks are smart combinations that help balance blood sugar (i.e. provide your body with consistent energy). I love good quality, natural jerky and a dried berries as a quick, portable option. Another favorite is hard boiled eggs and sliced cucumber, both sprinkled with lemon pepper. Cut bell peppers with hummus, yogurt dip or miso tahini dip (all of which are really easy to make yourself) are also favorites. I love to eat superfoods such as medjool dates (pit removed) stuffed with some nut butter and topped with some maldon sea salt. It is salty and sweet but but balanced in fibre and healthy fats to keep me going to dinner. Perfect afternoon pick me up! Being a work at home woman I spend many hours at my desk and my tip is, don’t eat at your desk. 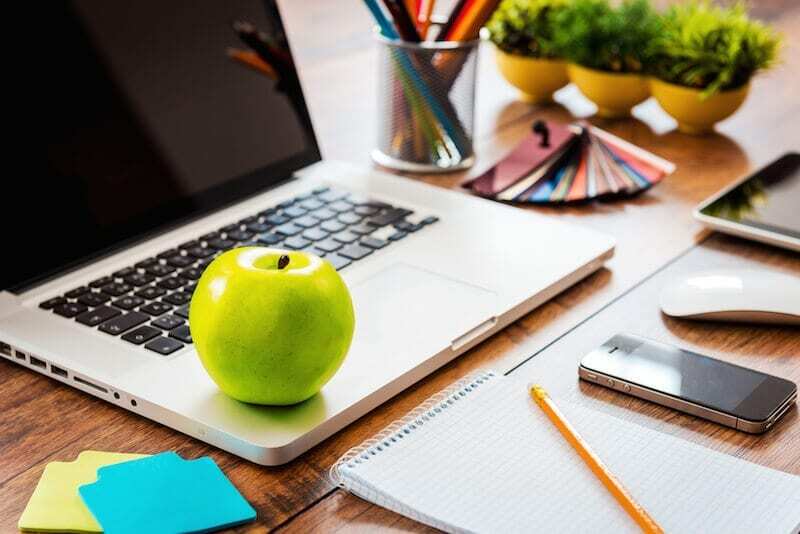 Eating at your desk while working causes mindless eating, which can lead to over eating or eating things that are not healthy because you are not really thinking about what you are snacking on. I like getting up and stretching my body, then taking a short walk outside with the dogs and snacking on a handful of almonds, or sprinkling some almonds and raisins in my Greek yogurt to enjoy while on my walk. I even enjoy a handful of granola mixed in my yogurt on occasion. Another snack I enjoy is a bowl of berries (raspberries, blueberries and grapes). What I do allow at my desk is water. I drink water all day, every day. Don’t forget that getting up and stretching is so important when you work from home and sit all day. Lately, my favorite healthy vegan snack has been sushi. I’ve rediscovered it and I love it, since it’s flavorful, easy to grab on the go and easy to snack on. My newest favorite is this hearty omelette and eggplant sushi. Chickpea omelette and crispy pan-fried eggplant make such a wonderful combination. It’s rather filling, too, so you can have it as a main dish sometimes. Just pack some soy sauce or tamari as a side and you’re good to go. My current favorite snack is my super easy 2 ingredient frozen yogurt! It keeps us cool, is super healthy and really easy to make! My favorite snack is Everything Bacon! It’s salty, crunchy, fatty and satisfying. I like to make a big batch once a week. The recipe is from my cookbook Made Whole. It keeps it in an airtight container or stasher bag in the fridge. I snack on a few pieces between meals or pair with some avocado or greens for a mini meal! What is Everything Bacon? It’s basically bacon smothered in seeds and seasonings and crisped to perfection. One of my favorite snacks to have on hand for whenever I get hungry during the day is these Black Bean Brownies, because they’re quick to make and so ridiculously good! They can knock out even the strongest chocolate craving! I love energy balls, especially my Healthy Oatmeal Cookie Energy Balls as they are a quick source of energy, nutrition, taste like a treat, but are made with whole food ingredients, and they don’t need to be refrigerated! Just make ahead and keep in a tupperware on your desk for an easy burst of nutritious energy. My favorite snack at the moment is veggies with hummus or guacamole for dipping. I’ve been loving carrots, cucumbers and jicama with guacamole this summer. Sometimes I’ll even roast the jicama and to make jicama fries. My favourite snack are these Double Chocolate Chip Cookies as they’re secretly healthy, perfectly satisfying and super delicious. They travel well and keep their taste and texture for a good few days so they’re great for carrying around on the go. 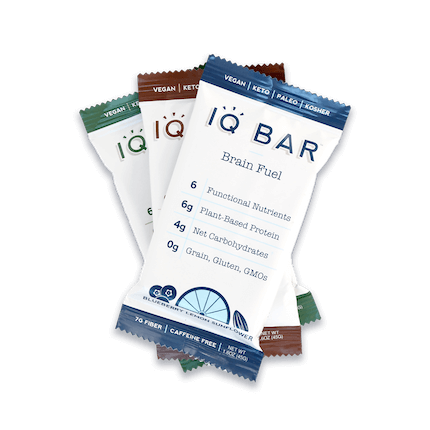 Keto, vegan and paleo-friendly, IQ BARs live up to their namesake by packing in six nutrients shown to promote healthy brain function. Don’t let this bar’s brain-boosting properties fool you: they taste great, too. Specialty flavors like Matcha Chai Hazelnut, Cacao Almond Sea Salt and Blueberry Lemon Sunflower are all equally delicious ways to enjoy this snacks’ 6g of plant protein. We don’t know about you, but we can never get enough healthy snack ideas. In fact, we’ve spent years researching and writing about the best healthy snacks out there, creating handy lists of wholesome go-to treats. 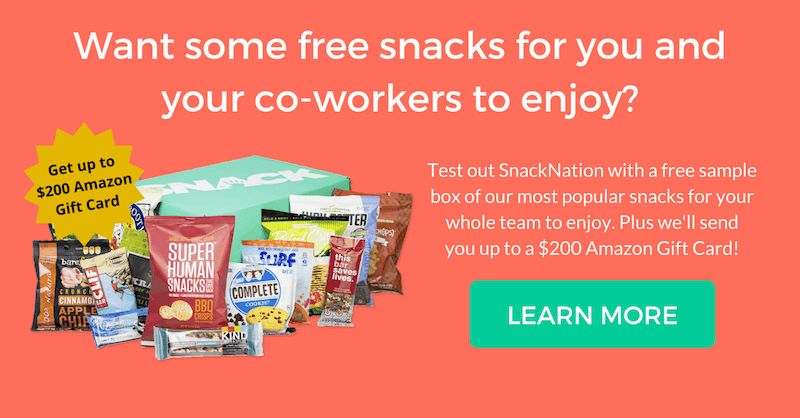 We made these lists because we’re passionate about good-for-you snacks, and more importantly, because we love giving you the resources you need to find feel-good snacks whenever and wherever hunger strikes, and strike it will; according to the United States Department of Agriculture, 90% of Americans have at least one snack a day. Luckily, with smart snacking options, you can snack every day and still feel like your best self. 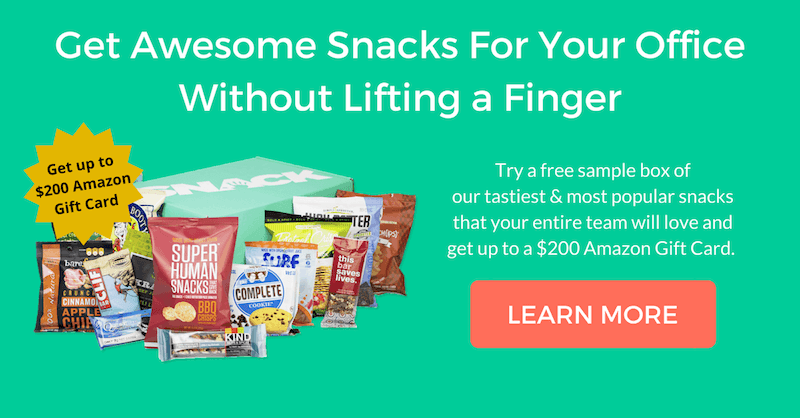 Browse our snacking roundups below to find something healthy to eat in any situation—to satisfy any craving and to fit the parameters of a variety of special eating plans. Are you trying to go vegan and finding it hard to resist a buttery cookie? Are you shocked and appalled that all your old favorite snacks contain gluten? (Yes, some flavored potato chips actually contain gluten!) Do you think it’s impossible to find low-calorie snacks that actually taste good? Our lists can help you out! 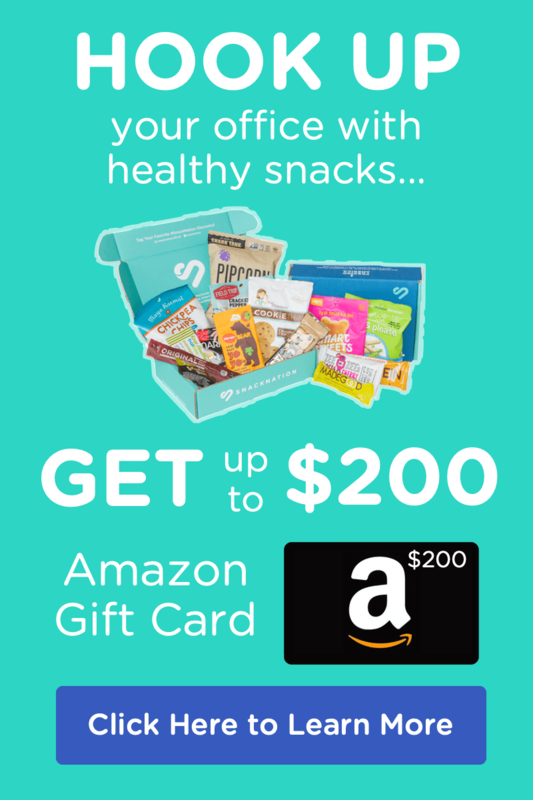 There’s little doubt that you can find some great new healthy office snacks after checking out the recommendations on this list. Which one are you going to stash at your desk and what tips do you have on how to eat healthy at work? Let us know in the comments below. consider groundnuts. it is healthy snack too…. I’ve tried seaweed before. I was really skeptical at first, but it has become one of my favorite snacks. I liked your recommendation of the Quest Nutrition bars. I’ve heard about them a lot lately and have been wanting to try them. I’ll keep my eyes out for them! Hey Luke! I think everyone has the same reaction to seaweed snacks when they first see it, but I’ve seen a lot of skeptics turn into raving fans! Quest Bars are everywhere now so you should be able to find them pretty easily. It’s hard to find a good-tasting protein bar that isn’t overloaded with sugar, but Quest Bar fits the bill. Protein snacks are so important for the afternoon slumps. I especially love anything I can throw in my purse/carry with me for emergencies! Loved this list of office snacks! I noticed a couple of snack bars on the list. Would love to have something like a Greek yogurt with berries and nuts. Dried fruits and apples are my favorite snacks. However, I am not really sure how much nutrition I get from dried fruits. I love healthy snacks! My favorite treat is sliced apples and cheddar cheese. Recently I brought a small wheel of bree and a baguette to work. Everyone was so jealous of my yummy treat. So I brought enough for everyone the next day. I love Medjool dates but i try to stay away because of their high calorie.. I love yogurt and nuts. Now I just need to remember to snack on them instead of eating half a can of Pringles! Thanks for the list. I like Pistachio and peanuts only in nuts, and it is always with me. But i am also usually eating some traditional sweet candy’s, and a cup of coffee. This is a great list! We’re trying to re-vamp our office kitchen with healthier but still AFFORDABLE (key word) snacks that are also sanitary to share (i.e. not a whole office reaching their hand into a bag of baby carrots, but individually-wrapped items preferred). Found individually-wrapped hummus and guacamole (great!) but fresh veggies hard to buy individual size. Suggestions on that and/or more items we can easily buy in bulk affordably (i.e. Jerky, while awesome, I think is off the list for us)? I love Sriracha flavored almonds , I don’t buy them that often because how quickly I eat them. I must agree with Anne-Sophie that nuts and specifically cashews are the best office snacks. They are really healthy, easy to carry and won’t cause any smell in the office. But my personal problem is, for this little pieces, when I start the first one, I would want the 2nd and the 3rd and so on until I finish eating the entire pack. My suggestion is to limit the number to bring to the office, in order to avoid over eating. I like eating cashews & apples. The list of snacks looks yum and so healthier. Fruit is a great office snack.I also like dried fruits. so beautiful post . This is described beautifully.